Armed Forces Officials Welfare Organization (AFOWO) is offering Raksha Towers, affordable apartments at Sector 1, Greater Noida West (Noida Extension). This prestigious project with various options of sizes and configurations, packed with latest specifications, equipped with all modern amenities and facilities, located at an area with high appreciation potential, that too at an extremely reasonable price, assures true Value for Money for its buyers. 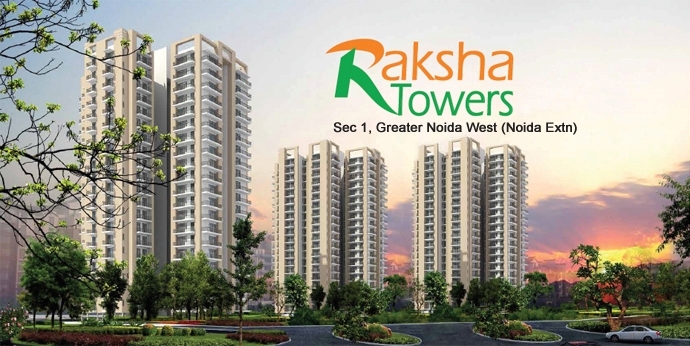 Approved by the Greater Noida Authority in all respects, the 2, 3 and 4 BHK spacious apartments of Raksha Towers are available in many sizes ranging from 985 to 1865 sq ft. An important feature, probably available for the first time in the region, is the personal entrance way for each apartment on all the 20 floors. The two side open plot, housing the three towers, has beautifully landscaped gardens and green areas with ample open and covered parking space. Multi level security with CCTV cameras, 100% power backup for elevators and common areas, regular water supply, and other features like community hall, jogging track, swimming pool and many more, make this project a really good buy for all those dreaming to own a good house in Delhi-NCR. Whether it be flooring, sanitary fixtures, electrical fittings or finishing, only the best quality and high specification material are being used in the construction of Raksha Towers. The construction of the apartments, under the regular supervision of experienced engineers and staff is going on at full swing with a concerted effort to complete and deliver the project well within the stipulated time frame of delivering it by end 2017. Another important factor in making Raksha Towers an investment with high appreciation potential is its enviable location. The project is located at Sector 1, Greater Noida (West), which will become the first sector from Noida once the bridge being constructed over river Hindon is complete. The new bridge, located barely a kilometer from the project, will connect Greater Noida (West) with Noida Sector 78, and Sector 1 will be the first area for anyone coming from Noida. The bridge, being constructed at a fast pace, is slated to be completed by the time Raksha Towers are delivered. A lot of construction activity can be noticed in the vicinity of the project including commercial spaces, IT parks, knowledge park, hotels etc. Luxury farm houses are being developed just opposite the main road, besides many residential projects with thousands of apartments coming up. Well connected with Delhi-NCR, the project is barely 1.5 km from the FNG corridor and very near to the proposed metro line. The price at which the apartments are offered in Raksha Towers is very competitive compared with other projects in the area. The affordable price coupled with various payment options makes it a realistic housing option for people from all strata of the society. Moreover the project has been approved for home loans by many banks including Axis Bank, HDFC Bank, Central Bank of India and DHFL. Raksha Towers, are being developed and offered by the Armed Forces Officials Welfare Organization (AFOWO), which works on a NO PROFIT NO LOSS basis, and is managed by retired defence forces officers. The organization and its executive members are credited with delivering many projects at Gurgaon, Noida, Delhi, Nainital etc giving unprecedented value to its buyers. With a lot of positive aspects associated with Raksha Towers, Greater Noida (West), along with the track record of AFOWO, the project is poised to prove a gold mine for those who take the right decision of buying an apartment in the scheme, with only a few units left on offer.